One moment, people were enjoying the Bank Holiday heatwave. The next, their roads had turned into rivers, with water lapping against their front doors. In an hour, torrential rain on Monday afternoon damaged businesses and flooded homes – and was gone as quickly as it arrived. 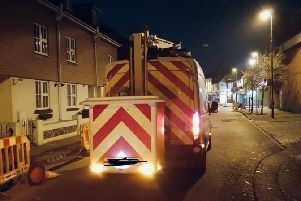 Firefighters were called to 40 incidents, particularly in Littlehampton town centre, Rustington and Angmering, on Monday, with crews working ‘tirelessly’ to pump water away and isolate electrics. There were no reports of injuries. Darren Prior, owner of A2B 24hr Taxis in East Street, said the carpet in their office would need to be replaced, and a wall and electrical circuits may have been damaged. He said: “It was obviously a shock. It happened so quickly; within half an hour there was at least a foot of water backing up out of the drains. It was like a Florida storm. A complete downpour with sunshine before and after. She donned high boots and waded through the water to help others, and spotted people in New Road, mopping their kitchens. With her fellow group members she co-ordinated the response before the fire service arrived half an hour later. Arun District Council praised them for a ‘sterling effort’. An East Street resident, who did not wish to be named, said his neighbours rallied together to help each other and redirect traffic away from the flooding. He said: “There was a real community spirit. Southern Water said it sent crews to internal flooding in 13 homes and gardens and has been carrying out clean-up of the area, using dehumidifiers and heavy jets to clear debris. In response to the Littlehampton Traders’ Association’s request, Arun District Council is organising a meeting to discuss how to prevent the flooding happening again. The Littlehampton Flood Action Group is also meeting with Southern Water on July 6 where the floods will be discussed.